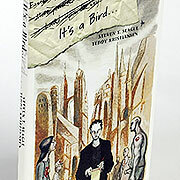 Archived Entry - 06/16/2004: "Graphic Novel Review: "It's a Bird""
06/16/2004 Archived Entry: "Graphic Novel Review: "It's a Bird""
Believe it or not, there are a few rules and regulations writers of all media risk disobeying at their own peril. One of the most important ones is: "Never, ever write a story about writing." You can probably get away with having a novelist or a scriptwriter as a protagonist, but you risk the wrath of the gods if you have the audacity to base a story on the process of writing. well, sure, Joseph Heller got away with it with "Portrait of the Artist as an Old Man" (but he literally got away with it just because he was Joseph Heller), but it's a very risky thing to do, unless you have the background and the genius to pull it off without seeming like you're treating the audience to a huge indulgent exercise. Many writers are so full of both megalomania and self-loathing (myself not excluded) that it's hard for the typical reader to relate terribly well. Anyway, Steven Seagle's "It's A Bird" is quite the risky exercise: a graphic novel about writing comic books, specifically Superman, so the issues and themes Seagle addresses can be applied to the superhero genre in general. But, fortunately, it's not just about that, but Seagle's struggles to understand and cope with a horrific hereditary disease passed on in his family. Seagle's growing confusion, helplessness, and anger converges with his struggles to understand his own reluctance to take on the job offered to him on a silver platter by his editor: the task of writing Superman. He wonders whether there's a place for Superman in both a grim, adult world and in a medium that has become increasingly violent and cynical and, most of all, if Superman truly represents justice and idealism or merely the ancient principle of might-makes-right. Dispersed throughout the book, interrupting the action in Seagle's life, are brief vignettes from the Steven's imagination (one, my favorite, is of a woman who realizes that everyone in the world who reaches out to other people has a bit of Superman in them) and from (apparently) his own notes about Superman. If this sounds like things you've thought about or read about before, you're right, although in my opinion Superman seems to get less critical attention than his darker and more psychologically enticing counterpart Batman, and, while Seagle certainly goes at the Superman mythos from a variety of angles (while at the same time making insights on life, justice, charity, and history), he makes no conclusions that are particularly earthshaking. Of course, that's probably the point, and indeed "It's A Bird" is much more about Seagle using Superman to make a point than Superman being channeled through Seagle. To Seagle's credit, he spares no punches on his own character (assuming, naturally, the narrator isn't a complete fabrication). In the course of the book, he alienates his caring girlfriend, fails to tell his brother about their father's disappearance, and punches colleague and close friend "Joe Allen" (suggested to be fellow Superman scribe Joe Kelley) for no good reason. Unfortunately, Seagle goes a bit overboard and turns himself into an unsympathetic narrator. While the segments concerning his family's disease are heart wrenching, his failure to cope with it and his lashings out against his loved ones are not so. Even if the narrator isn't just an unfiltered mouthpiece for Seagle, his actions can be perplexing and obnoxious. As for artist Teddy Kristiansen, he is without a doubt a gorgeous and unique visionary, but I couldn't help but wonder if he was the right artist for this project. His unfocused, dream-like style works brilliantly with the vignettes about imagining Superman, but in the real world segments it doesn't seem to fit in well. For instance, one character, Rafa, who is supposed to be a young Latino looks like a starving vampire. It's also not perfectly clear what audience Seagle is aiming for. The usual Vertigo crowd will probably pass it by (especially since it doesn't involve "The Sandman"), even though Seagle has been a staple writer at the imprint. Likewise with many Superman fans, who will probably recognize right off that this isn't really intended to be an expose on Superman or the process of imagining worlds for them. Aspiring comic book writers (like, again, myself) might be tempted to take a peek, but information about the industry and about the 'lifestyle' is just between the lines and, besides, they might find themselves wondering what the big freakin' deal about writing Superman is. There's no doubt that "It's A Bird" is well crafted and somewhat insightful, but, at least for me, it left me wondering if I missed something.